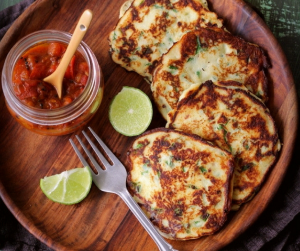 If you love pancakes, but have more of a savoury palate than a sweet tooth, then these yummy cheesy morsels will be right up your alley. Gluten free, with a bit of a chilli kick, and with some dark green antioxidant superfoods snuck in there, this is one tasty breakfast you can enjoy as well as feel good about! Hello Sunday morning scrumptiousness! Method 1: Drain any excess water from the ricotta by keeping it in a strainer lined with cheese cloth or muslin cloth. 2: Transfer the drained cheese in a mixing bowl and whisk with a spatula until smooth. 3: Add the spring onions, egg yolks, green chillies, rice flour, salt, chilli flakes and spinach leaves and mix them in well. 4: In a separate bowl, whisk the egg whites until stiff peaks are formed. Fold in half of the egg whites to the cheese mix and then add the rest of the egg whites. 5: Spray a non-stick pan with oil and add 2-3 tablespoon of cheese batter. Spread it a little with the back of a spoon and cook till the bottom begins to turn brownish and then flip and cook the other side in a similar way. 6: Remove from heat and serve with your favourite relish.